Paris Saint-Germain and Real Madrid lock horns again in Champions League in the return match in Paris on Tuesday night. Are you backing PSG to win? Jetbull bookmaker is offering a stunning 9/1 price boost! Maximum bet is £10, so you can make a £90 net profit with a £10 bet! PSG need to overcome a two-goal deficit to progress and they are heavy backed to win the return match against a struggling Real Madrid. They have scored a record-setting 25 goals in the group stage of this season’s Champions League and have won every single one of their competitive home games so far this season. 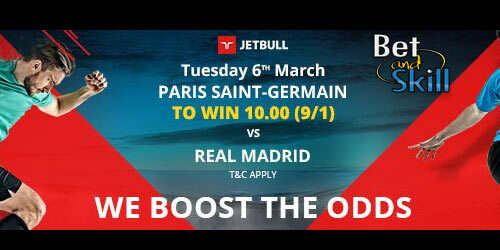 Jetbull offer 9/1 Paris Saint Germain to beat Real Madrid in Champions League! 1. New customers only. Exclusive to players registering through BetAndSkill. 3. Winnings will be paid as free bets. "Get 9/1 PSG to beat Real Madrid at Jetbull! Max bet £10"